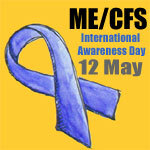 A campaign for ME/CFS Awareness Week by Action for ME features the faces of people of all ages and backgrounds affected by the illness. “… we want them all to tell us and the world their story. I know, from those we have received already, that they will be stories of courage, determination, endurance and above all, hope. You see all the Faces of ME through the web site and read some of the stories behind the people too.